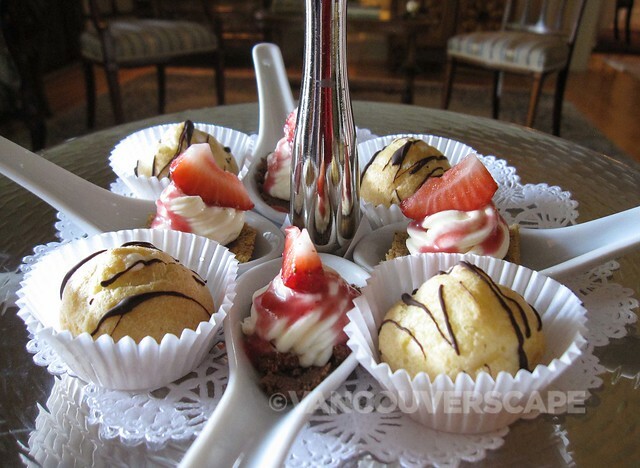 While at Rowena’s Inn on the River, my husband and I dined one evening at River’s Edge Restaurant and spent a cozy early afternoon enjoying tea service inside the Inn. 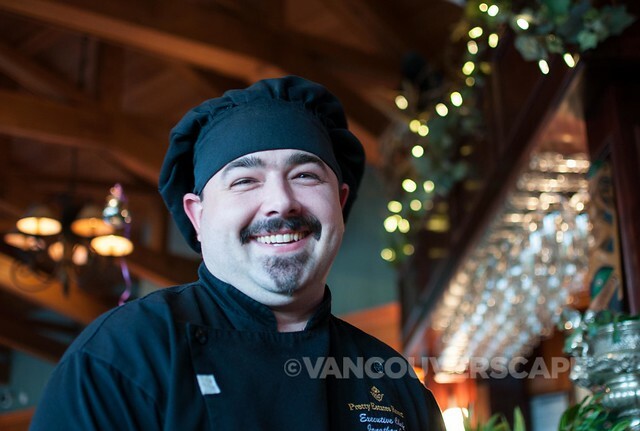 River’s Edge uses local ingredients and Oceanwise-sanctioned seafood in its dishes, with Executive Chef Jonathon Gee heading the kitchen for the last two years. Gee previously worked at Harrison Hot Springs Resort’s Copper Room. 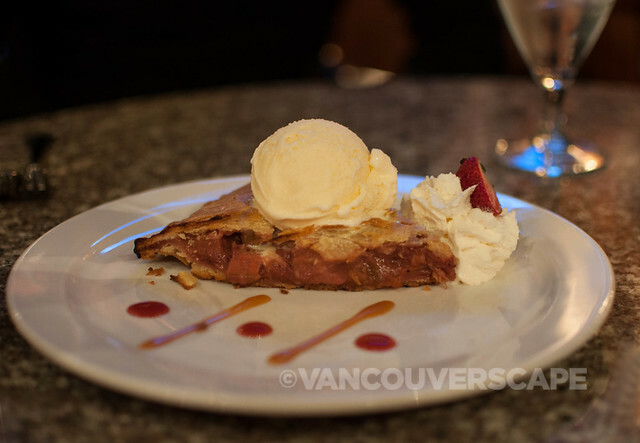 The menu offers a wide range of dishes to suit all appetites, from Fraser Valley duck to AAA Canadian Prime Rib. We started with the Sandpiper Salad ($10 half/$14 full) and Seafood Chowder ($6 cup/$9 bowl). The salad is stocked with dried cranberries, roasted Agassiz hazelnuts, cheddar cheese, bacon, crisp greens, apple, artichoke hearts and red onion, dressed in a strawberry balsamic vinaigrette. I could have ordered the full portion and been quite happy for dinner. I noticed how the bacon and roasted hazelnuts combined so well together, set off by the slight tartness of the cranberries. The seafood chowder is rich, hearty, and incredibly tasty – a great start to dinner. 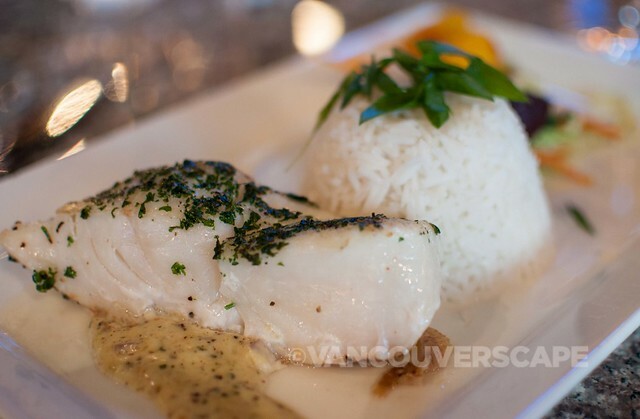 For mains, I ordered the Oceanwise Herb-Seared Halibut with lemon bay basmati rice ($30) while my husband dined on the House-Smoked Whiskey Braised Pork Ribs ($26) made with 40 Creek Whiskey, bourbon BBQ sauce, and served with black pepper-flecked pommes frites. While the wine menu offers several BC VQA varietals, we chose a couple of glasses of J Lohr Cabernet Sauvignon ($11/6 oz; $16/9 oz; $43/ bottle). This hearty cab is wonderfully balanced for the pork ribs, and adds texture to the fish’s slightly seared taste. After having lived in California for nearly 20 years, I like to call this one a classic cabernet. Both dishes were expertly prepared and beautifully served. 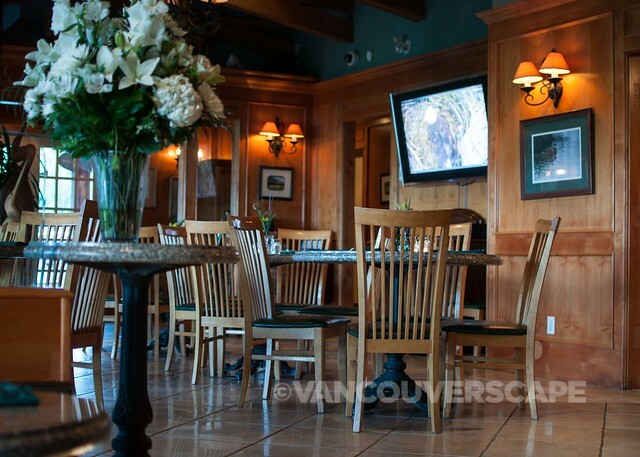 The restaurant is casual, with marble-topped tables leading into a sunken area with several booths and tables, offering a prime view of the mountains and of Harrison River. First Nations art graces the walls, a few pieces suspended from the ceiling behind the bar in back. The live Bald Eagle cam is displayed on a flatscreen TV on the wall near the entrance. Once in a while, we’d hear the chirp or cry of one of the eagle parents. It was almost as if we were outdoors. Dessert for me was a pot of crème brûlée; my husband enjoyed the daily pie special: apple-strawberry-rhubarb à la mode on the evening of our visit. Both desserts were enjoyed with Americanos to top off a relaxing meal by the river. 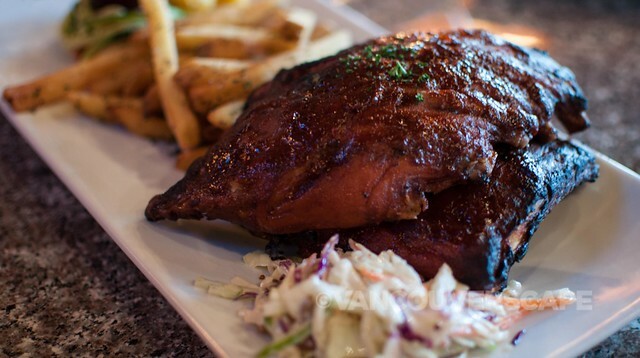 River’s Edge also serves Sunday brunch. If you’re planning on visiting on Mother’s Day, there’s a special brunch service on May 11. Visit the website for more details. 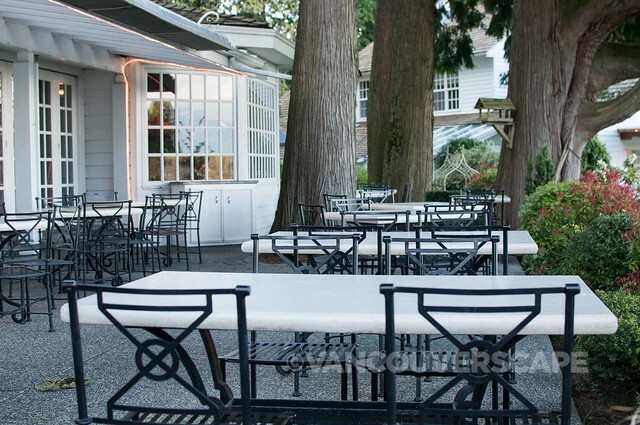 River’s Edge is open seven days a week from 8 am to 9 pm and is located at 14282 Morris Valley Road in Harrison Mills, BC. 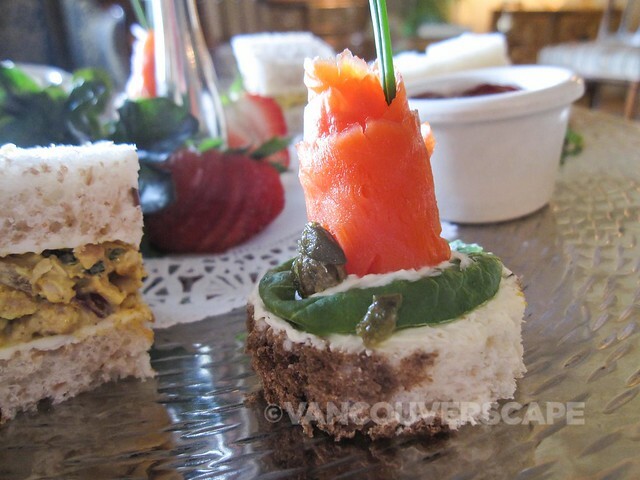 We also experienced Afternoon Tea ($20/person) at Rowena’s Inn. 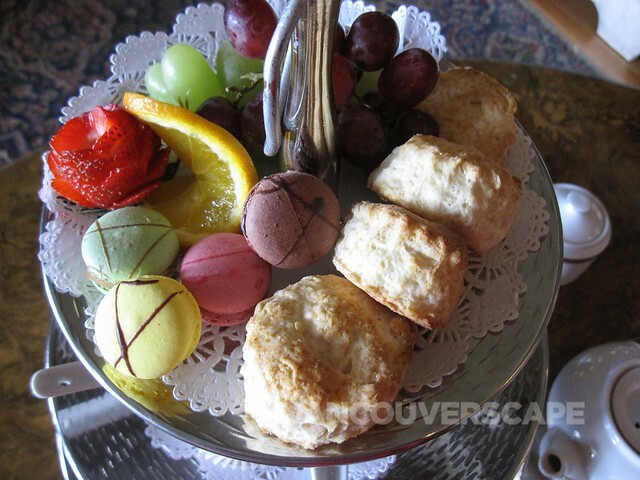 Daily service (from 11 am to 4:30 pm) includes a three-tiered tray of scones, macarons, cream puffs, strawberry cream cheese bites, and cucumber, smoked salmon, and chicken curry finger sandwiches. A pot of tea in the Inn’s antiques-filled salon completes the picture, making for a relaxing way to take in the views of the lush landscaping, mountains, and Harrison River. 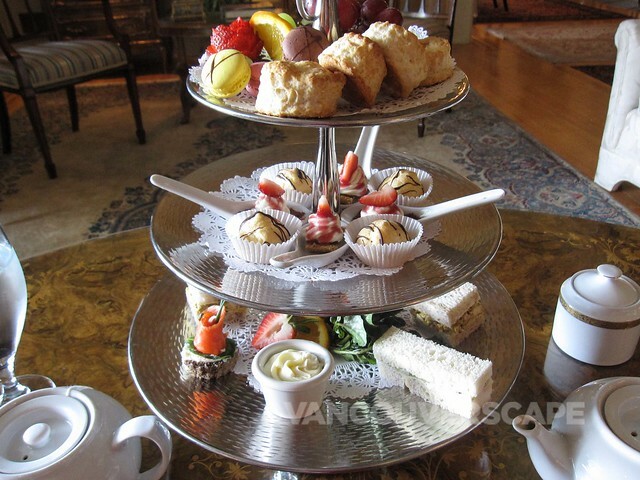 Our dinners and afternoon tea service were compliments of Pretty Estates Resort.